ROCCO FORTE’S ULTIMATE SPA GETAWAY IN SICILY. The locale was already luxurious enough. But just last month, Rocco Forte Hotels announced the brand will open the perfect accouterment to their roster: Rocco Forte Spas – starting in their Verdura location. Going off of the omnipresent desire for better life, and better health, the company has created an unforgettable new experience that promotes longevity and wellness, in a fascinatingly beautiful setting. 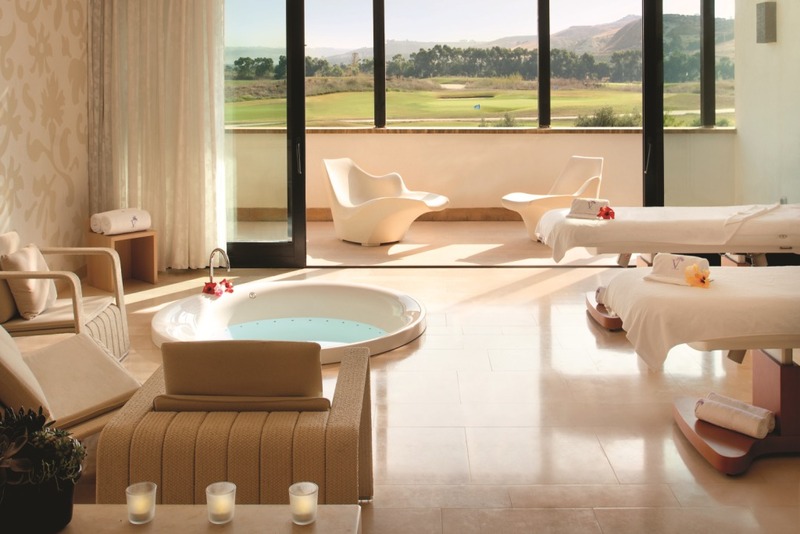 At Verdura Resort, Sicily, the flagship spa of Rocco Forte Spas, the spa complex includes 11 treatment rooms, a fully-equipped gym, fitness studio, a 25-meter indoor lap pool, four outdoor Thalassotherapy pools, a double-height steam room, infrared sauna, Finnish saunas and a Spa Bar. RETREAT FROM WORK AND THE EVERYDAY. Set amid olive groves, oranges, and lemon trees, Verdura Spa philosophy is based on Sebastian Kneipp’s five pillars: water, plants, exercise, nutrition, and balance. Each pillar improves well being, but it is through the interplay of all five at Verdura Spa that self-healing begins. Kneipp’s treatments involved many different water applications, from cold rinses, hot and cold baths, contrast baths and even hot and cold compresses, which he felt strengthened the body’s self-healing power. Verdura therapists perform treatments using different temperature compresses, private steam baths, a hydro massage bath and a Jacuzzi. Guests can follow a thalasso circuit at their leisure in the resort’s four outdoor Thalassotherapy pools. They can also use the infrared sauna, Finnish saunas, double- height steam bath and experience showers. At the spa, local plants and herbs have been carefully selected and integrated into treatments, through Forte Organics. Many of the ingredients used are grown at Verdura, including the herbs throughout the Rocco Forte Nourish menus. FOR FOODIES, AND THEN SOME. And not to worry – this is not a spa serving three peas and a bit of lettuce on a plate. World-renowned celebrity chef Fulvio Pierangelini delivers healthy menus inspired by the organic produce grown in the area. The menus are rich in fruit, vegetables, fish, olive oil and whole grains – the perfect balance in a Mediterranean diet. Nutritionally balanced food and the re-education of the body to crave what is good for it are at the heart of the approach. With Rocco Forte Fitness, there’s a variety of programs designed to suit individual tastes and needs. 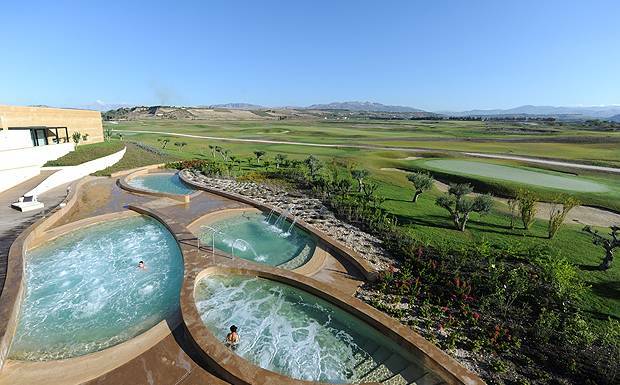 Further, training at Verdura Resort is not limited to the Verdura Spa facilities. Jogging, trekking and cycling trails meander through the resort’s olive, orange and lemon trees. Trekking tours are also available outside of the resort, such as in the Torre Salsa Nature Reserve. Then there’s a plethora of tennis and golf available to the guest, as well as someone on hand to tailor a program to one’s goals. Rocco Forte Health offers a balanced and integrated approach to health, with state of the art techniques and programs designed for every guest, available exclusively at the resort. The five health-focused programs are available: Fit, Slim, Detox, Anti-Age and Relax. Each one of these bespoke programs is available for a period of three days or six. The Rocco Forte Fit program, for example, is designed to help achieve fitness goals, whether training for an event or kick-starting a good exercise regime. Both the six and three-day programs begin and end with consultations with the Fitness Manager, and guests will be given tips to take home. The six-day program then involves five personal training sessions, full-board fitness dishes, and smoothies, two sports compresses, as well as several treatments including four sports massages, two revitalizing facials, a saline scrub, a saltwater bath and Shiatsu. What could be better than the symbiotic combination of the Italian seaside, the perfect spa environment, and a Michelin star chef? If there’s something better, Sir Rocco Forte and Company will certainly come up with it soon. But for right now, Verdura will certainly suffice. Previous ArticleBEAUTY PRODUCTS TO KEEP YOUR SKIN GLISTENING THIS SUMMER. Next ArticleAN INTERVIEW WITH NANCY GALE, FOUNDER OF JAMAH.